We love Indian food. But, it’s pretty expensive to eat out at the good restaurants all of the time so we like to make our own. 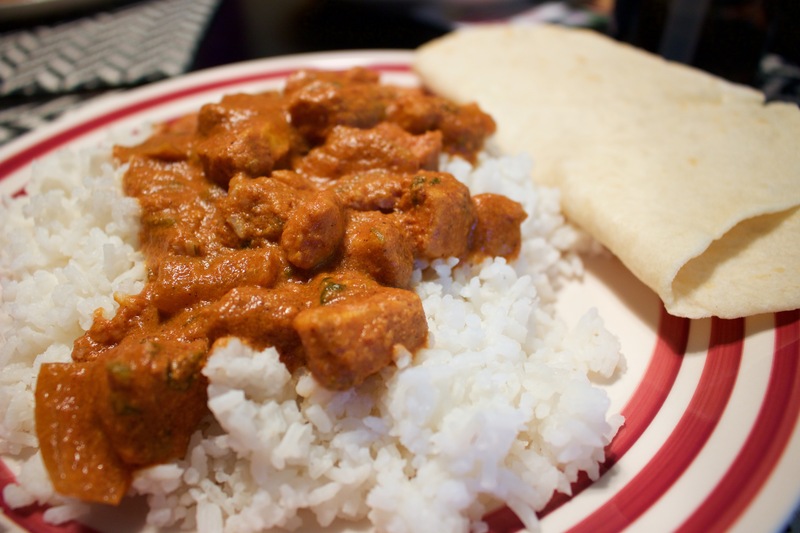 Today, we made Butter Chicken in the crockpot so it could cook while we were gone all day. We like our food spicy, and with only 1 tsp of chili powder we found it pretty bland. Next time we make this we will be upping the amount of chili powder for sure. We chopped the cilantro and added it to the crockpot, but you’re supposed to use it as a garnish after it’s dished. I say, do what you want. With the whole can of tomato paste it came out a little bit too strong. Next time we will be cutting that down a little bit. Our efforts in finding a decent roti recipe have failed us thus far, but we find that homemade tortillas are a suitable replacement.